Our Companions Animal Rescue : pet adoption, pet training, education and is building a Pet Resource Center as it works towards solving the root causes of pet homelessness. 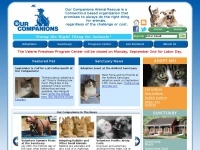 A profile of Ourcompanions.org was found on the social network Facebook. For managing the data of the webpages the CMS WordPress in the version 4.9.9 is used. The website uses the latest markup standard HTML 5. The website does not specify details about the inclusion of its content in search engines. For this reason the content will be included by search engines.